Stronger is the memoir of Jeff Bauman, a Boston Marathon Bombing survivor who is just that, a survivor. Stronger is a story of pain, forgiveness, growth, and hope, and now it is a film starring Jake Gyllenhaal. It is out on DVD this week and available on iTunes already. On April 15, 2013, the Tsarnaev brothers detonated two bombs near the finish line of the Boston Marathon. Three people were killed, hundreds were injured, and nearly twenty people lost limbs. 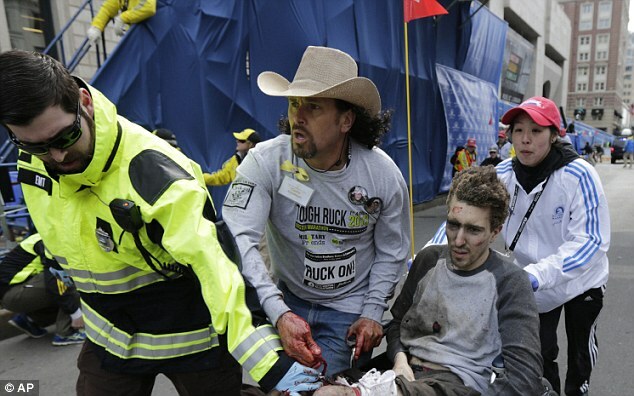 Jeff Bauman was one of those nearly twenty people. He was standing right by the site of the backpack bomb left by one of the brothers, and when it detonated, it blew off his legs. That day, as the world watched in shock, Jeff Bauman’s image went viral. He was being whisked away from the scene in a wheelchair. The full image was gruesome and hard to look at. Here’s a cropped version. I knew about Jeff Bauman only vaguely before picking up this book, in preparation for watching the movie over Christmas Break. I knew he had been a victim of the bombing, I knew he had lost both his legs and fought to be able to walk again. I knew he had been there to see his girlfriend run the marathon. But, there were so many things I didn’t know about Jeff Bauman that this book taught me, and one of the most heartwarming parts of his story was how much of a normal guy he was and is. Jeff Bauman wasn’t a super successful person before the bombing, and he hasn’t tried to pretend after the fact any differently. He worked in the deli at Costco. He never finished college. He lived at home with his mother. He and his girlfriend liked each other but had already broken up once and were struggling. In Stronger, we learn how all these things that Jeff felt like were failures in his life played into his healing and his strength in the aftermath of the bombing. We learn how he feels about the Tsarnaev brothers and what it was like to be one of the only people to have seen the brothers at the scene. He talks about meeting the other survivors, the first responders who saved his life, and the celebrities and athletes he got to meet while recovering and doing press events afterwards. I particularly enjoyed Bauman talking honestly about how much doing those events stressed him out. Yes, it was nice to meet famous people and show how strong you are, but you just lost two legs and you’re not sleeping and your relationship is strained, and it isn’t always easy to put on a happy face for a television interview or baseball game. If you’re wary about reading this book for traumatic reasons, don’t shy away. Yes, the background for Jeff’s story is horrendous, and some of his descriptions of his leg surgery made my skin crawl, but overall Stronger focuses on Jeff’s recovery and his relationships with those around him and not on the actual crime committed against him. It’s not as graphic as it could be, by far, and a great read overall. To tie it all back to the movie, here is a picture of Jeff and Gyllenhaal promoting the movie Stronger.